This innovative air displacement arm provides accurate and reliable pipetting without the need for system liquids, providing greater convenience and lower maintenance requirements for applications using disposable tips. Available with four or eight pipetting channels, it offers a broad volume range from 0.5 to 1,000 µl per channel, with non-contact dispensing down to 0.5 μl. The large volume range is ideal for a multi-purpose genomic workstation (nucleic acid purification and normalization, plus PCR set-up), offering more freedom in assay design. Each channel offers optimized pipetting for a broad range of liquid types and volumes; free dispense is possible down to 0.5 μl with CVs below 6 %. To avoid the risk of cross-contamination, each pipetting channel has a user exchangeable inline filter which prevents liquid being drawn into the pipetting head. Combined with permanent pressure monitoring through Freedom EVOware, this maximizes process security and protects your valuable samples and equipment. UK-based Oxford BioDynamics has automated its proprietary biomarker discovery platform, EpiSwitch™, on a Freedom EVO® 150, helping to establish a NGS, CGH-array and PCR-based pipeline for the discovery of novel biomarkers, as well as a PCR protocol for biomarker-based diagnostic testing. The DNA Section of the Orange County Crime Laboratory has recently taken delivery of its first Air LiHa equipped Freedom EVO® workstation for DNA quantitation and amplification reaction set-up. Complementing the laboratory’s existing liquid displacement Freedom EVO platforms for DNA extraction, this new instrument will help to streamline the workflow and improve pipetting precision. Tecan is pleased to announce that the first Air LiHa air displacement pipetting arms have left Tecan’s production facility in Männedorf. 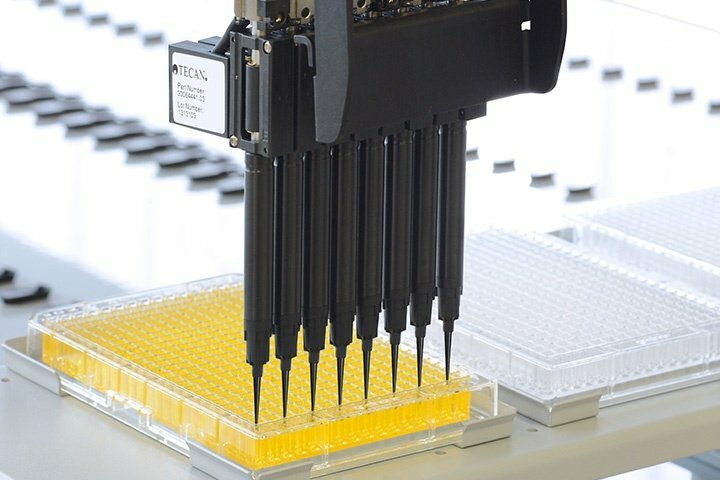 Designed to offer an unrivalled level of flexibility for Freedom EVO liquid handling workstations, this innovative module is Tecan’s most compact single channel pipetting option, and offered a number of fresh challenges for the manufacturing team. The upgradeable Freedom EVO platform can evolve with your changing application needs making your initial investment even more valuable.